Over the six weeks, ASCD's 2014 Whole Child Symposium has been delving into the topic of the future of education, offering educators events, vast resources for reading, and methods to engage. This effort was born from the national dialogue about what we want and need for education today and tomorrow. Many voices, both expert and practitioner, have chimed into the debate, sharing their point of view on the priority issues. More than half of the 572 readers who responded to the poll shared one voice on the future of education. They reported that the purpose of education was to create learning conditions that enable all children to develop to their fullest potential (53 percent), agreeing substantially with remarks made by Sir Ken Robinson at the ASCD Annual Conference in March, where he called for schools to create the conditions so students can "connect with their natural aptitudes and be in their element." In the second position, readers selected creating adults who can compete in a global economy (18 percent) as the purpose of education, reflecting the findings of a recent survey (PDF) of business executives which called for a focus on global competitiveness. Finally, the last two items were least likely to be selected as the primary purpose of education. 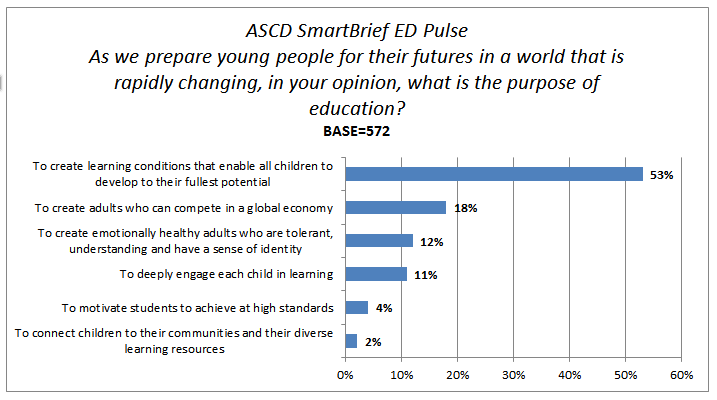 This survey question was included in ASCD SmartBrief, a free daily e-mail news service that provides summaries and links to major education stories and issues, which has more than 215,000 subscribers. Using ED Pulse, the weekly online poll, data was collected from 572 readers, starting on April 24, 2014. Online surveys do not provide a random sample, as participants are self-selected, meaning that a margin of sampling error cannot be calculated or quoted. In addition, the population and sample are limited to those with access to computers and an online network. However, online surveys have been shown to produce results that have proven to be reliable predictors of outcomes, including election results. If you have a question on education that you would like to see addressed in a future ED Pulse poll, feel free to submit it in the comment section below, along with any other comments.